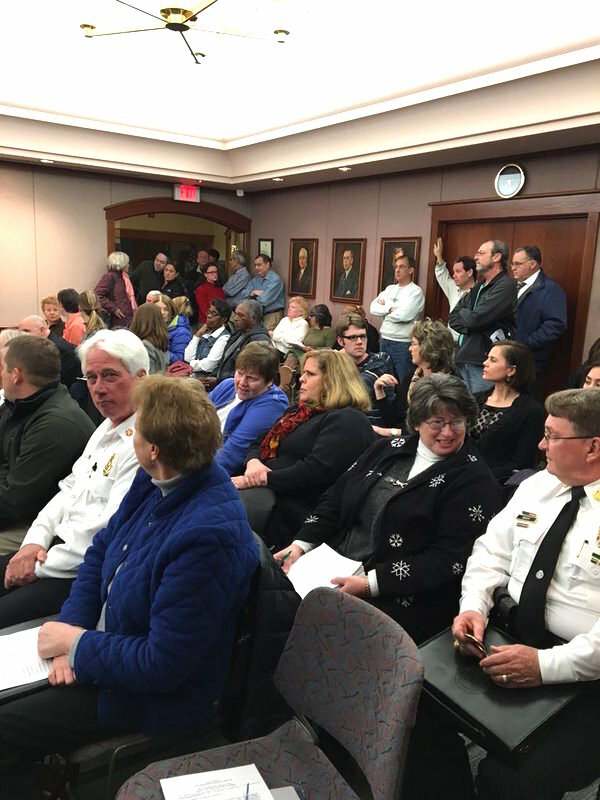 An overflow crowd of Boland Place/Arch Terrace-area residents turned out to express concern Monday night (Jan. 4) as the Richmond Heights City Council prepared to consider a site plan and rezoning ordinance for a proposed 203-unit apartment complex on Boland between Dale Avenue and I-64/U.S.40. Developer Joe Cyr, of ILI, LLC, and architect Bob Koch, of Fugleberg Koch Architects are not scheduled to present their proposal to the council until its Jan. 19 meeting. However, about 40 residents came out for Monday’s council meeting after learning the site plan appeared on the agenda; prompting Mayor James Beck and the council to begin taking public comment on the project. During 90 minutes of often detailed presentations, nine speakers contended the apartment complex would clash with the residential neighborhood, snarl traffic, violate zoning regulations and perhaps even fail financially in an increasingly competitive rental market. Several speakers urged the council to be selective in approving any project for the site, noting St. Louis’ Central Corridor – including Richmond Heights – has again become a “hot” area for real estate development. Cyr, though present for the meeting, did not respond to comments. Mayor Beck promised to accept additional public input on the project, following the formal presentation by the developers at the council’s Jan. 19 meeting. In terms of Clayton/ Big Bend, in my opinion a mixed use ground level retail building would be a great replacement for either the hideous office building at 6744 Clayton OR the Office Depot behind it or both (search for what they are doing up the street at Hanley and Clayton at the old Schnucks spot). I think if you wanted to zoom out from there the entire block where Hi Fi and Starr’s are now would also be a good candidate for this type of mixed use (Starr’s could go in the the new building at ground level). The point here is that the retail at ground level will have a much better chance of survival due to the high traffic from Big Bend/Clayton that is already there. Trying to ramp up traffic on Dale is a terrible idea and it makes zero sense. It will be harder for businesses there to survive because their business will be very “streaky”. Mark my words whatever retail/restaurants go in on Dale will change over often. These are not revolutionary ideas but unfortunately we are left with a Richmond Heights that is now willing to risk the property values of its resident home owners for a windfall of tax revenue. Tax revenue that in the long run is not guaranteed and very uncertain. There is a distinct lack of an overarching vision, all that remains is simply reactionary “me too” bandwagon-jumping decision making, particularly by the city’s P&Z Commission. This all does not bode well for the city’s future. I hope residents turn out in April and vote in new leadership before it is too late to turn this all around. If you have lived in St. Louis for longer that a decade you’ve seen this all before. Richmond Heights is starting to become the new St. Ann (circa the late ’80s early ’90s). Look at what happened to that place after they over developed and things went bust. Folks from that area high tailed it out of there to St. Charles County. I wonder where Richmond Heights refugees will head to after the city get’s it’s “progress”. The place is becoming a disaster. How about focusing redevelopment on Clayton Road/Big Bend? That block is long overdue for something like this, which would be a great addition there. No you smack it right in the heart of where all of your single family homes are… Wow! There are some real mouth breathers in that City Hall folks. Also, what ideas do you have for development along Big Bend and Clayton? The corner has numerous small businesses and no unoccupied spaces. (The northern half of the corner is in Clayton.) Along Big Bend north of 64/40, the Post Office is being renovated and will include subleased tenants. The once vacant building immediately north of the highway is now an orthodontists office. Do you have a proposal for the empty Hi-Fi-Fo-Fum building?